Last week, as you may remember, I treated myself to two new cookbooks, both of which showcase some of the more unusual gastronomic treasures to be found around the Mediterranean’s far-flung shores. The recipes are so tempting that I started planning a long to-cook list, but I hadn’t gotten very far when something perturbed me: at least *three* of the herbs and spices called for in these recipes were nowhere to be found in my spice bowl. This scenario really flusters me, for reasons of pride I probably shouldn’t probe into here, but the upshot is that my spice collection grows a little with each new cookbook I acquire, because I do whatever is needed to track down the spices in question. One of the missing spices, fennel seeds, was easy to obtain, its absence from my bowl simply the result of forgetting to replenish a depleted supply. The remaining two, however, proved to be a bit more elusive: dried edible lavender buds and rose petals. After unsuccessfully perusing the spice shelves of all the major supermarkets and ethnic grocers in town, I reluctantly turned to the internet as a last resort. Normally I’m no shrinking violet when it comes to spending money at the click of a mouse, but I’ve never really liked ordering edible things online. I would never consider ordering my groceries over the internet, for example, though I know a lot of people who swear by its convenience. I simply don’t trust someone else to pick the ripest fruit and the freshest-looking meat, and I like knowing I can change my dinner plans on a whim if something else just looks better. There’s something about food’s subjectivity and fragility that just makes it better to buy when you can hold it in your hand, see its color and smell its perfume. There’s also the impatience factor: when I have a craving for something, I want to make it now, not next week when the ingredients arrive. In any case, it was either brave the internet or go without, so of course I braved the internet, and I’m so happy I did because I’ve come up with a fantastic find, a UK-based supplier of organic herbs and spices, and yes, even edible dried flowers. I placed my order on Friday, and on Monday morning, a box had already arrived containing these oh-so-chic little stainless steel canisters with glass lids, that when opened billowingly exude a breath of intense lavender and roses. Lavender is very popular in sweet-and-savory dishes, such as Barbecued Lamb Kebabs with Honey and Lavender, Lavender Honey and Mustard Pork Tenderloin, Salmon Filet with Lavender Honey and Tamari, Lavender-Glazed Meatballs, Lavender Pistachio Lamb Chops, and Lavender Cream Chicken. It can show up in soups: Lavender Leek and Potato Soup, Cold Melon Soup with Lavender; and in salads: Ojai Orange Salad with Lavender Vinaigrette and Lavender Chicken Salad. It can grace pizza: Lavender Pizza; cheese: Chevre Marinated in Lavender and Fresh Herbs; and nuts: Lavender and Orange-Glazed Pecans. It apparently takes well to baking: Lavender and Hazelnut Bread and Lavender Shortbread; frying: Lavender Ricotta Fritters; and freezing: Lavender Ice Cream. It can quench your thirst on a hot day: Lavender Limeade, Lavender Margaritas, and Lavender Kir, and satisfy even the sweetest sweet tooth: Pear and Lavender Clafoutis, Lavender-Raspberry White Chocolate Cheesecake, and Chocolate-Hazelnut Baklava with Lavender Cream and Hazelnut Bark. Rose Petals, especially the dried kind, are a little more enigmatic. Most recipes that want to incorporate rose flavor opt for rose water or rose essence, both readily available in Indian and Middle Eastern shops. A little more sleuthing was involved in finding recipes to use the petals, but the ones I found are wonderfully exotic, indulgent and sensual. 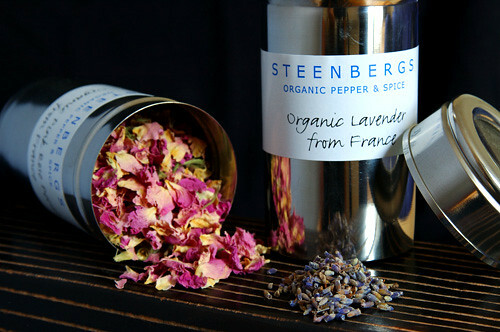 I’ve included recipes here that use both fresh and dried petals. Recipes I came across included Rhubarb and Rose Petal Jam, Damavand Yogurt and Cucumber Cold Soup with Walnuts and Rose Petals, Chicken with Honey and Rose Petals, Quail in Rose Petal Sauce (from Like Water for Chocolate), Pullum Frontonianum (Apicus Chicken), Maraqat al-Safarjal (Sweet Ragout of Quince and Lamb), Grilled Chicken with Rose Petal-Mango Sauce, Cherry and Rose Petal Soup, Almond Pestinos in Rose Petal Syrup, Champagne and Rose Petal Sorbet, Rose Lassis, and a fabulous collection of rosy recipes at The Joy of Soup, including Rose Petal Omelettes, Rose Petal Drop Scones, Linguine with Rose Petal Pesto and Green Tea and Rose Petal Popsicles. pretty pretty spices… one of my favorites is lavender chocolate truffles. Steeping the lavender in the hot cream lends itself to the earthy note of chocolate so well. I haven’t played with rose in there, but it would be gorgeous to bite into!Have you seen the movie “Like Water for Chocolate”? Both the book and the movie have a memorable seen involving a rose petal chicken dish. Melissa, I used their rose petals for the grilled quail recipe from the first Moro book (I made a post recently), I bought it at the Good Food Show last year. Don’t buy vanilla pods from them, though, I was really disappointed. Zarah, they seem to have very high-quality spices and quite reasonable prices. Besides the flowers I bought two spice blends, Moroccan ras-el-hanut and Ethiopian berbere, which both smell fantastic. Anyhow, as soon as I make something with my new loot, you can be sure I’ll post about it!McAuliflower, you bet I’ve seen ‘Like Water for Chocolate’! That aphrodisiacal quail-in-rose-petal dish has been on my mind for an absurdly long time. Maybe it’s time to finally make it…Keiko, I loved that post of yours on the quail recipe – the beauty of that recipe and photo was what finally compelled me to buy the Casa Moro cookbook! And thanks for the tip on the Good Food Show, maybe this year I’ll just have to make a trip down to Birmingham. hi mel, did manuel take that photo of the steenbergs chic jars? i like it, the photo n the fact that they have edible dried flowers tempted my aesthetic taste buds, i want some of those!! !imagine i m checking ur blog, who doesnt care to cook. that must be a good sign! oh opsideisy, i meant i who DONT care to cook… my pride made me fix that. Oh my GOD!! Besides dark chocolate, lavender anything is one of my weaknesses and that treasure trove of links that you have up there is making me all giddy with delight. What a fine blog you have here and I’m sure glad that I was into bloghopping today…Now to get on with checking out those links! Hi FoodieTwoShoes – Twins separated at birth, maybe? That is eerie… 😉 Before the advent of food blogs I believed I might be alone in the world, as no one I’d ever met was quite so obsessive about food and cooking as me. But now that I’ve discovered the ‘support group’ of the internet I know that’s not true, and it’s wonderful to meet so many like-minded people. Thanks for stopping by, and thanks for the link to that recipe – it looks absolutely enchanting! Exactly! I used to feel like a freak surrounded by ‘normal’ people who just didn’t understand my enthusiasm er..okay, obsession for all things related to food. Then I discovered food blogs and eGullet and knew I wasn’t so strange after all. My idea of a perfect day is one spent inside all sorts of food shops. I’m on the lookout for the rose petals myself – £10 charge for a delivery to Dublin seems rather steep – so I’ll keep online ordering as the last option. I have just imported a some edible dried flowers that include rose buds, chrysanthamums and peach blossom.Absolutely fantastic. Thank you so much for recommending the site! Was looking for somewhere to buy edible lavender and that site looks perfect.